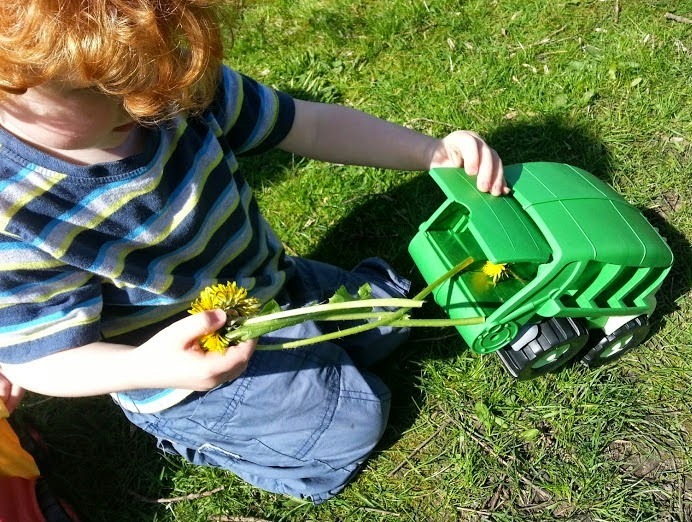 We love Green Toys. They're big, chunky, sturdy and most importantly they're made almost entirely from recycled materials. 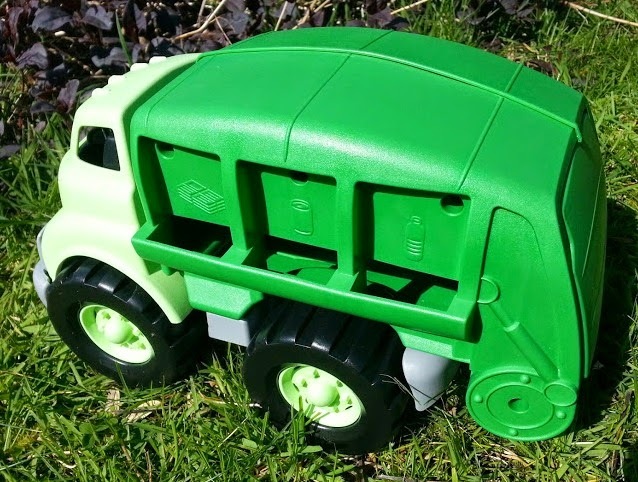 The Green Toys Recycling Truck is made from 100% recycled plastic milk bottles. 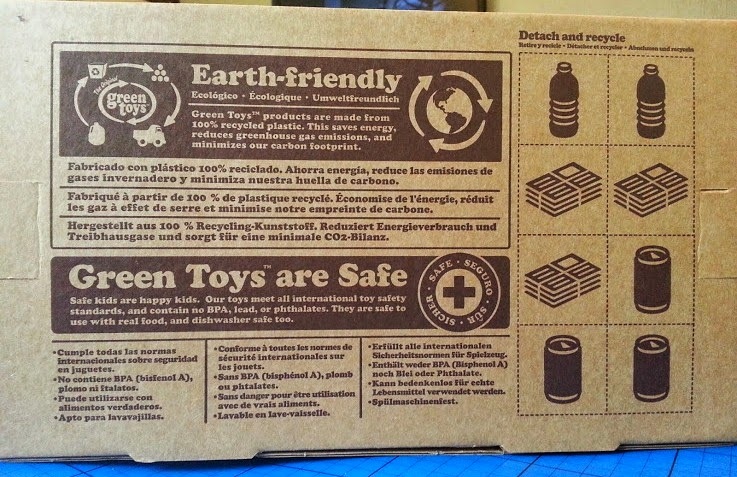 The packaging for Green Toys is fantastic, it tells you all kinds of useful information and is entirely recycled and recyclable cardboard. This means the toy can be removed quickly and safely, even by a small child. 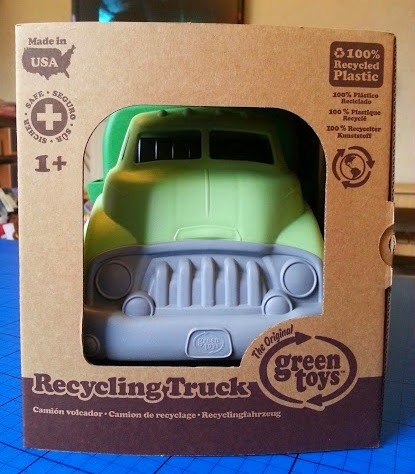 In this case, the packaging even includes cut out 'recyclables' for you to play with. Before you even unbox, you can see the toy - you know what you are buying. You can also see some of the detail that makes these toys such beautiful objects. 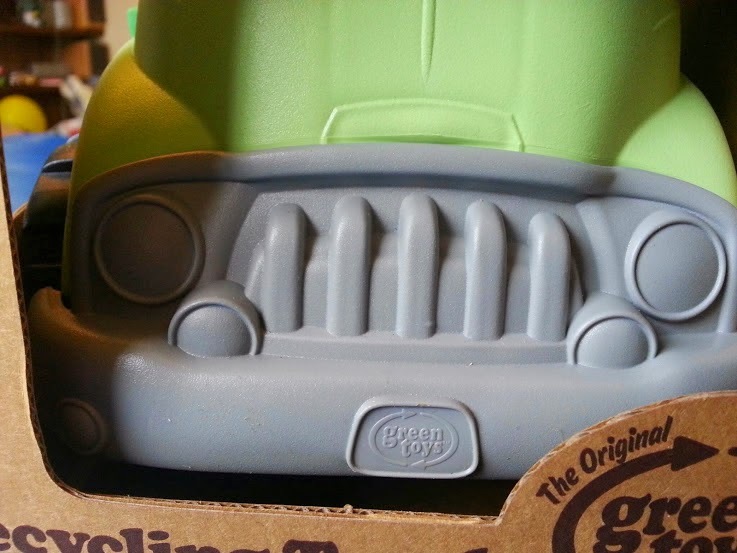 The textured surface of Green Toys is really nice to touch, and feels almost soft, and easy to grip - like the plastic milk containers it's made from. It makes them lovely to hold and very different to most plastic toys. At the sides of the Recycling Truck we have 3 different sections for your recyclable rubbish - bottles, cans and paper. They're clear and universally understood. My boys knew what it meant straightaway. 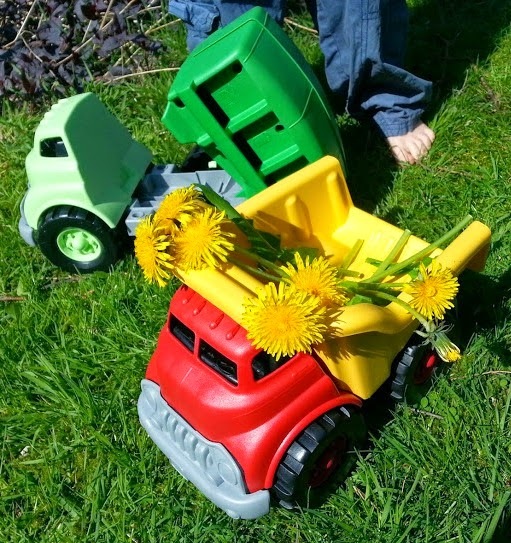 The way the wheels are attached means there is no metal, so the toys can be completely submerged for washing and won't go rusty. You can hose them down or even wash them in the dishwasher. Handy if a very young child will be playing with them indoors. It wouldn't be a proper bin lorry if it didn't tip up to empty out the rubbish! And the back of the Recycling Truck opens right up, so your child can retrieve the 'rubbish' they've used to fill it very easily. Again it's brilliant for cleaning purposes. 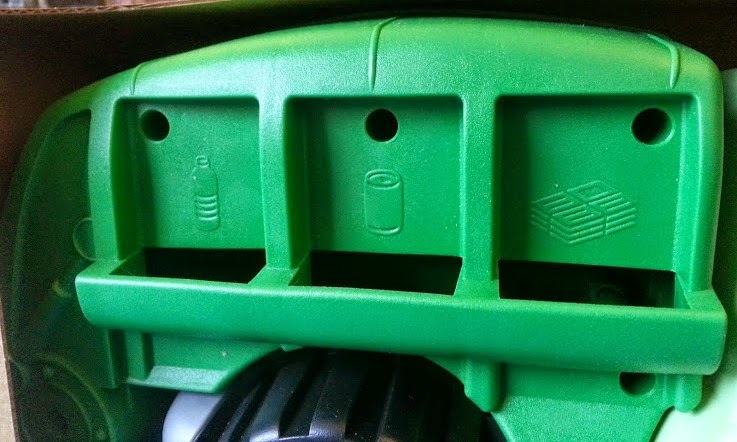 There's a notch at the bottom of the tailgate so that it's really easy for any child to open. My 4 and 5 year old boys have played with this a lot. 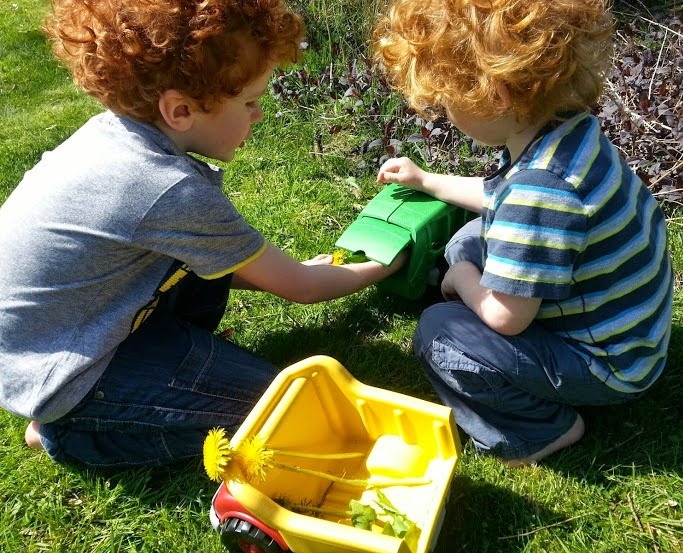 They love being able to take it outside and no-one cares if it gets dirty or muddy. I don't mind them filling it with beautiful flowers, sticks or insects. The 2 boys play really quite complex games with the Recycling Truck. They fill it with sets of 3 items for 'recycling' - usually things like stones, sticks and grass. They'll then go and sort these items and put them into the 'correct place', so grass will go into our compost bin for example. 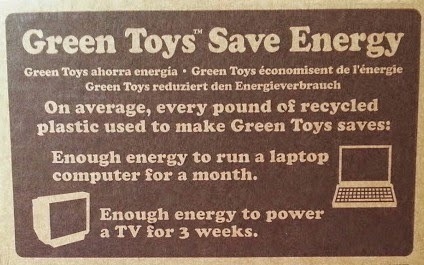 I think it's an excellent way to make recycling a part of everyday life, nothing special or exciting as such, just something we all do. 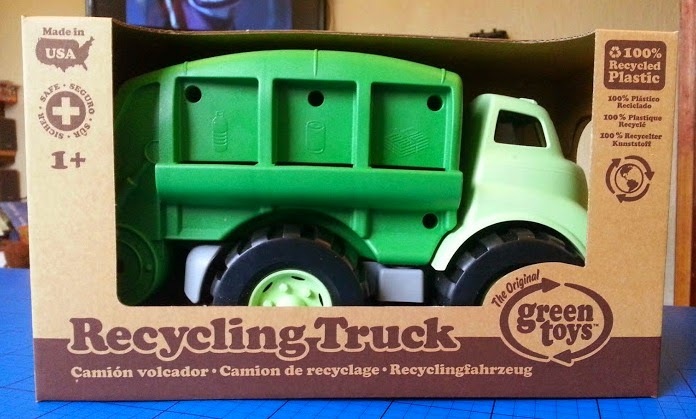 The Green Toys Recycling Truck costs £19.99 and is suitable from 1 year. It will last your child(ren) for years, making it a really good investment. 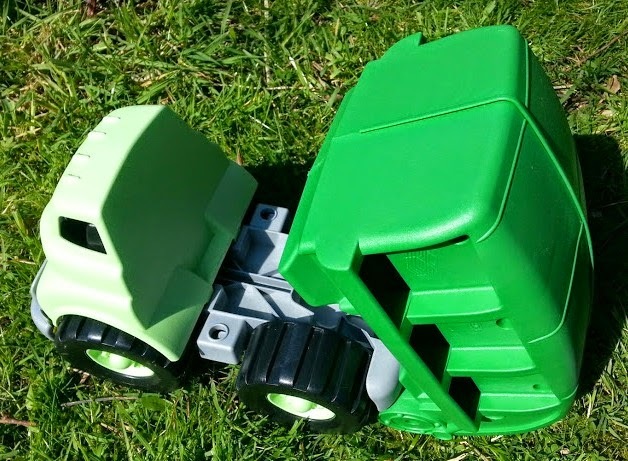 Green Toys are available online from Bigjigs Toys website with free UK delivery on all orders over £50. 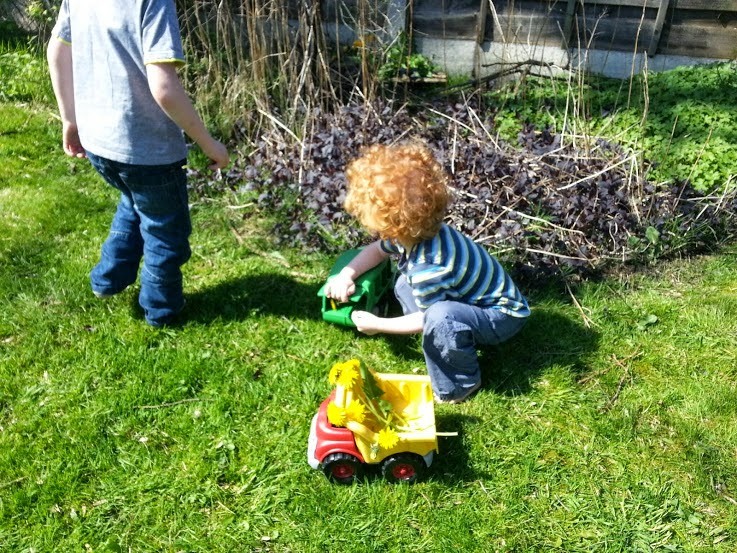 We've also reviewed the Green Toys Dumper Truck shown in these photos, and the Green Toys Rocket with 2 astronauts. It's brilliant - the boys love it. They can post thins into it and I don't get annoyed! Do you think I'm still young enough to get me one ?? ?